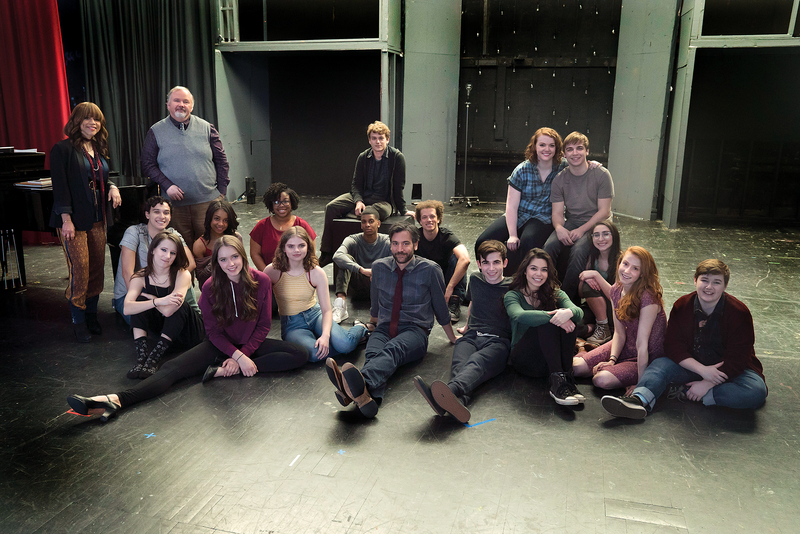 Josh Radnor (center) and the cast of NBC's Rise, the new television series based on the book Drama High by Michael Sokolove, inspired by real-life high school teacher and Thespian troupe director Lou Volpe. Photo courtesy of Peter Kramer/NBC. Radnor has also directed and written the films Happythankyoumoreplease and Liberal Arts. His recent stage work includes the Broadway premiere of Pulitzer winner Disgraced and the New York Stage and Film production of his own play Sacred Valley. His latest TV work includes the PBS miniseries Mercy Street and the new series Rise, which premiered on NBC in March. In Rise, Radnor plays Lou Mazzuchelli, a character inspired by Thespian troupe director Lou Volpe, whose story was also chronicled in the 2013 bestseller Drama High. Dramatics caught up with Radnor while he was finishing principle photography for the new series. 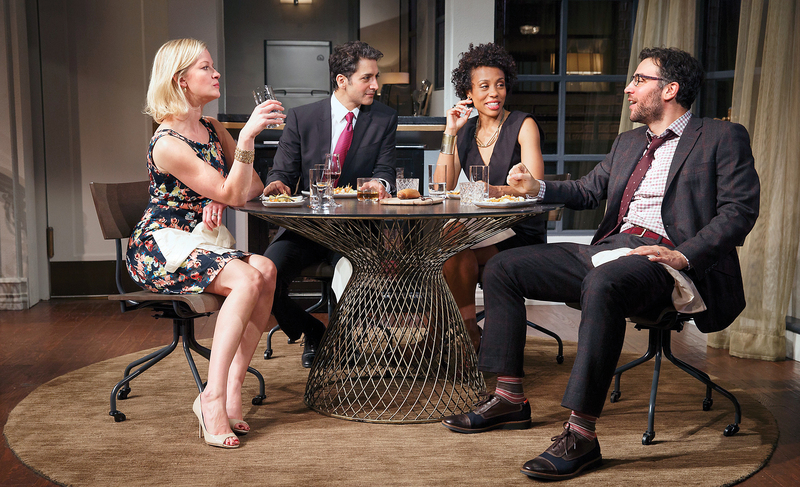 of the Pulitzer Prize-winning play Disgraced. Photo by Joan Marcus. Do you remember Dramatics magazine? JOSH RADNOR: I do. My inner 16-year-old is over the moon that I’m being interviewed for it. You grew up in a musical household. JR: My dad can’t carry a tune, but my mom can. She was also a big musical theatre lover. I didn’t get into theatre, though, until high school — and it was half-accidental. My friend Debbie wanted to audition for the chorus of Oklahoma!, but she was nervous, so she asked me to sit with her. They pointed at me and said, “Are you going to audition?” The next thing I knew, I was on stage — and I got one of the leads. It was great fun. The following year, I played the Emcee in Cabaret and knew then that I wanted to continue doing theatre. I found my way to Columbus Junior Theatre, now called Columbus Children’s Theatre, run by Bill Goldsmith. Every summer, he would do a musical with teenagers from all over central Ohio. There was intense competition to get a spot, and I did three summers there — with some extraordinarily talented people, a few of whom became professional actors. My third and final summer, we took Into the Woods to the Edinburgh Fringe Festival. It wasn’t until college, though, that I went all in on theatre, and I ended up as a drama major at Kenyon. I got a proper liberal arts education, but most of my nights were spent in the theatre. Spring semester of my junior year, I went to the O’Neill’s National Theatre Institute in Connecticut, which was a beautiful, formative experience. One thing you did at NTI was write the play Napoleon Blownaparte. JR: There was a terrific playwriting teacher there, Donna Di Novelli, who hooked into my writing. She was one of the first people who said, “You’re a writer.” Something unlocked in me there, not just as an actor but also as a writer. I was writing some interesting, weird, wonderful stuff that was surprising me. So, I ended up writing this play, Napoleon Blownaparte. You’ve said that once you found theatre, life went from black and white to color. JR: That’s what it felt like. In high school, I didn’t have a grander sense of purpose other than to get good grades and get into a good college. I had a creative streak, but it wasn’t until I got into theatre — and started to meet professional actors — that I thought I could do it as a career. It felt impossible. I’m from Columbus, Ohio, and no one in my family had ever done it. So, I had to reach outside my community to figure out how to do this. And I’m still amazed that I’ve been able to do it. I have a lot of gratitude, because I understand how rare it is. Even after many years of doing this, the thrill hasn’t gone away, because I have vivid memories of being a teenager scared to even voice that I wanted to do this. It seems you were methodical, purposeful in how you approached your career. I thought I would go to the East Coast for college, but I had a strong instinct about Kenyon. And it was win-win, because that was my father’s alma mater. He was thrilled that I wanted to go there, and I just had an instinct that it would be the best fit for me as both a student and an actor. If I had a revelation about Juilliard, it would’ve been a different conversation with my dad, but it worked out. I ended up going to the Graduate Acting program at Tisch, but I was methodical about the way I talked to my dad, slowly unveiling pieces of information. I did a lot of research and presented him with the options. He was a lawyer, so he responded to thoughtful analysis. It showed him that I wasn’t some bohemian artist going from thing to thing without much thought, and he respected that. Right of out school, I signed with an agent and two months later, I was playing a role Off-Broadway, which was a real thrill. That’s how I got my Equity card. You’ve described the next couple years, though, as a shock of icy cold water. JR: It wasn’t just navigating the early years of being a professional actor, it was navigating not having a set schedule for the first time. I didn’t have anywhere I needed to be, unless I had an audition. I was making enough to not need a day job, but I wasn’t doing enough to not go a little crazy, which is why I started writing. I describe it as a life of snow days. I would do a play for three months or a few guest spots on TV that paid a decent amount. It’s an adjustment to realize that your job is auditioning, because especially when you’re starting out, you do a lot more auditioning than working. I couldn’t get much film and TV work in New York, so I went to L.A. My first audition was for Off Centre, a WB pilot, and I got the job. I ended up being replaced though, when they picked up the pilot to series, which was a rollercoaster of euphoria and crushing disappointment. I went back to New York and did two plays. Theatre caught me — and reminded me that I am good at this. I wondered though if I should quit or just do theatre and not bother with film and television, because maybe I don’t have what it takes for that — or double down and keep going. Six months later, I returned to L.A., and I got The Court, an ABC show with Sally Field. We shot six episodes, but they only aired three. It didn’t last, but it was a great experience to work with such terrific actors. I had to dig deep and find some grit I didn’t know I had. A couple of years later, my father said he thought getting fired from that WB show was my big break. He thought it was formative for me — and he’s right. Two weeks after The Court was cancelled, I made a tape for The Graduate and was back in New York to audition with Kathleen Turner and Alicia Silverstone — and I got the part. It put some wind at my sails. In one year, I went from getting fired, questioning whether this business wanted anything to do with me, to starring on Broadway. I began to see more sky, to feel that more things were possible for me. and directed. Photo courtesy of IFC Films. You’ve said that theatre has been an anchor for you in unsteady times. JR: For years, I used to say I felt most comfortable in theatre. I was a fish in water there. I knew what to do, because I had logged so many hours on stage. Around the time I was doing Mercy Street, though, I suddenly felt at home in front of the camera in a way that I hadn’t, even after all my years on How I Met Your Mother. So, I would say the one I love the most is the one I’m not doing. If I don’t do a play for a long time, I start missing it. 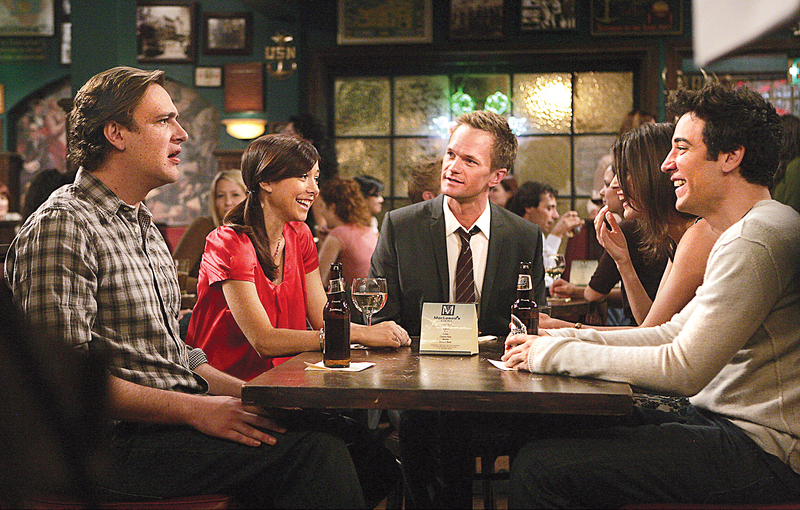 When How I Met Your Mother started getting a lot of attention, and I could see that we were probably going to be around for a while, I got a little depressed. As a young actor, anything is possible. Will I do a great film? Will I never work again? Will I do a Broadway hit? Will I do a Broadway flop? Anything is available, but life starts to crystallize as you make choices. That’s true of Lou, the character I play on Rise. He’s taught high school for 17 years, when he asks, “Is this it? Is this what my life is?” And he makes a bold mid-course correction to try something new. One secret I’ve found for living a creative life is to put yourself in harm’s way a lot. Freak yourself out. Say yes to things that you’re not sure you can do. Part of the fun in that is in disproving all those doubting voices raging in your head. Is your folk band Radnor & Lee an example of putting yourself in harm’s way? JR: Ben and I just started writing songs together for fun. When we started to take ourselves seriously as a band, we decided to record some of the songs and play some live shows. And some of that’s been terrifying, because whenever you take on something new, like a musical instrument or a foreign language, you feel awkward, you feel like a novice, you feel foolish and silly. But you have to push through that to get to the joy of acquiring that new skill. Writing songs, playing guitar, it’s been exhilarating. I love having a band with Ben. Rise deals with helping kids get over their great awkwardness. JR: The best teachers remember how hard it is being young. They remember teenage heartbreak and anxiety about the future. The “It gets better” campaign applies to what a lot of kids go through. There’s not one adolescent who doesn’t question their identity or where they fit in or what they want to do. It’s tough to be a kid — it’s tough to be a human — and the best teachers hold out some vision to keep their kids going. That’s a lot of what Rise is about. I have a lot of teachers in my family: my father taught at Ohio State Law School, my mom was an elementary school teacher, my younger sister is a teacher. So, I feel strongly about the teacher-student relationship. Someone pointed out to me that one strong theme in both my movies is mentorship. I understand what a good teacher can be to a student. What else do you hope people get from Rise? JR: You read so much about polarization in the country, about groups pitted against each other. Part of the genius of Jason Katims is that he’s a humanist, not a polemicist. He doesn’t write heroes versus villains. He writes complicated and human people. All of us want the same thing. We have different ideas about how to get it, but everyone wants clean water, clean air, good education, and safe streets. We’re not as different as we think we are. Rise is set in a working-class, former steel town in Pennsylvania that’s home to this theatre department that teaches empathy and compassion and stepping into other people’s experiences. What theatre does, at its best, is to shake you out of your own story and to show you that you’re much more than you thought you were. You have the ability to understand much more about other people’s stories. So, it feels to me like a great moment for a story like Rise.